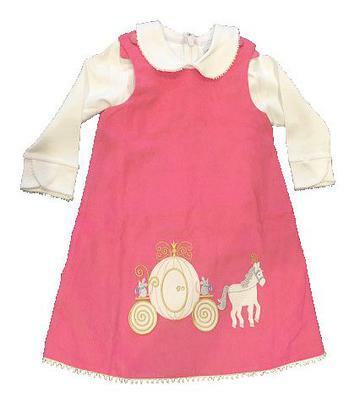 There is nothing more adorable than a pink corduroy jumper with a carriage and horse applique on the bottom. There is a beautiful loop trim on the bottom of the dress and two buttons on each shoulder to get on/off easily. The undershirt is white longsleeve with a peter pan collar and a white picot trim around the collar and sleeves. There is a zipper down the back to get on/off easily and this super soft outfit is 100% cotton.